Agnes Martin at the Guggenheim and Carmen Herrera at the Whitney. 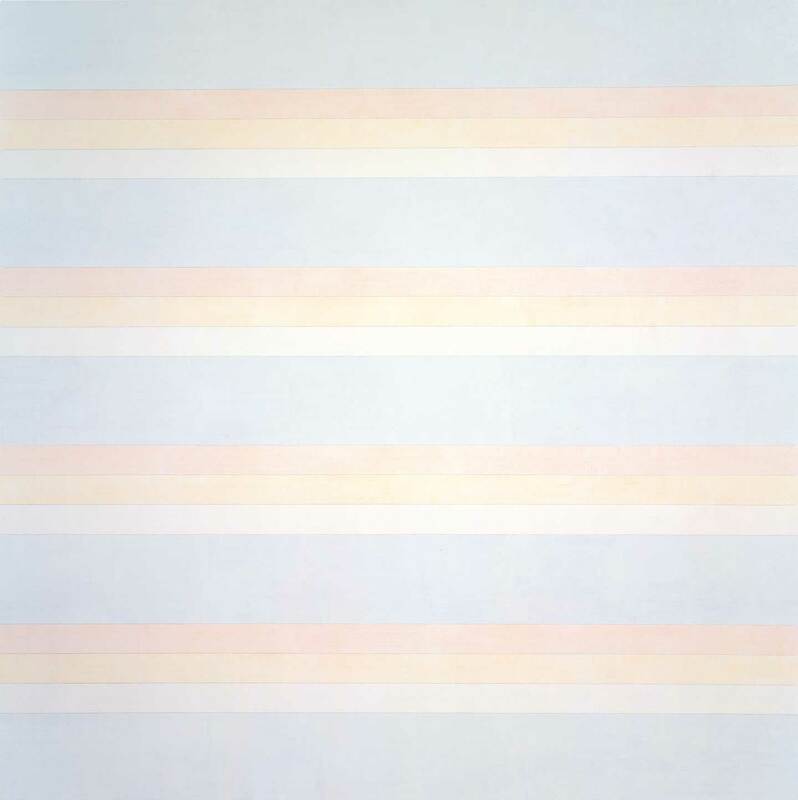 In a 1989 interview, Mark Stevens asked Agnes Martin how long she’d like a viewer to spend looking at one of her paintings. “Well, I’d like them to give it a minute,” she replied. I thought of this exchange recently while at the Guggenheim Museum. On view is a grand retrospective of Martin’s work, organized by Frances Morris and Tiffany Bell. It’s the last leg of a tour that began at London’s Tate Modern in 2015 and closes at the Guggenheim in January 2017. Also on view is Maurizio Cattelan’s America, his notorious (and functioning) gold toilet. The line of visitors waiting to use this accommodation was long when I passed it, stretching all the way out to the sign that the museum had placed explaining that the approximate wait from this point was two hours. Two hours! This was clearly not the toilet to use in a case of urgent necessity. But it struck me to wonder, as I walked past that seemingly unmoving line, how many of these people would spend another two hours with Martin’s exhibition. A minute isn’t much to ask for, you might think; and yet if you start to count the seconds as you stand in front of a painting, it’s longer than you’d imagine. I think Martin realized that, and so her proposition was more demanding than it sounds. While probably not very many people would give one of her paintings a minute, those who did would in fact end up giving it much more time than that. At its best—which is often—Martin’s work is hypnotic; its near-emptiness, if you give yourself over to it, seems to hush the hurly-burly of everyday life, the world that Wordsworth once observed was “too much with us; late and soon.” Two minutes in front of her work—or even 15—can have its rewards. Unfortunately, the Guggenheim is an infelicitous place to see Martin’s paintings, for many reasons. The most obvious one is that the tilted plane of the museum’s floor makes it very hard to attain the point of equilibrium that Martin’s paintings, so ingrained with a feeling for horizontality and verticality, ask their viewers to find in themselves. Another is that the linearity of one’s path through the Guggenheim (so different from walking around the rectangular rooms of a museum like the Tate Modern) means that it’s almost impossible to look from any distance at one of her paintings for as much as a minute without someone else getting in the way. At the Tate, where I was lucky enough to also see the show, people seemed to understand that their fellow museumgoers were trying to have a one-on-one experience with the paintings, and they could easily accommodate this by walking around you rather than in front of you. Not so at the Guggenheim. Martin’s great strength—and perhaps also her great limitation—is that she seems to have started out with far fewer presences in her mental studio than most artists; it took her less time, if not less effort, to get those few to depart. But for the easily distracted viewer, there’s some annoyance in having “everybody” turn up in the empirical form of fellow art lovers. Martin’s work would perfectly suit a monk’s cell, like the ones in the monastery of San Marco in Florence where Fra Angelico painted his ravishing frescos in the mid-15th century. It brooks no interruptions. “Stand behind the gray line,” a guard warned me as I leaned in to get a glimpse of one of Martin’s drawings through the glare on the Plexiglas in front of it. “I don’t see anything but gray lines,” I thought, but stepped back silently just the same. What’s unusual is how Martin used her gray lines: not, as artists have done for millennia, to create contours, to define and put boundaries around forms—but rather, to create vibrations. Martin’s paintings hum, and their hum is the resonance of a thousand lines coming into tune with each other and creating a sort of gray or lightly colored chord. For some 40 years, between the early 1960s and her death in 2004, Martin was one of our most rigorously consistent painters, rarely straying from her settled aesthetic. Square paintings with usually soft (sometimes pencil-drawn) horizontal or vertical lines, her work was a set of symphonies orchestrated in gray and white. Martin destroyed most of her early work, so it’s hard to know exactly by what route she arrived at her certainties. But by 1957, she was already geometricizing her whites and grays, though always keeping the boundaries of her forms soft, nuanced, rather than mathematically precise. And within a few years, those bounded forms would mostly disappear too, the canvas itself providing the only definite shape. There was one innovation Martin added to her consistency: After a seven-year abstinence from painting from 1967 to 1974, during which she produced only a suite of prints, she began adding pale washes of hues like peach, rust, pink, and blue—colors seemingly bleached out by long years in the sun. Already in her 50s at the time, artistically, Martin was a late bloomer even by the standards of the day. The earliest works on view at the Guggenheim are a drawing from 1952 and a few paintings dated from 1954 and 1955. One can already see signs of Martin’s austere sensibility, along with some surprising notes. They’re already as whitish and colorless as her work would ever be, but their sparse, wiry organic forms look like a distillation of Joan Miró by way of Arshile Gorky—surprising forebears when you think of how little remains in her own art of Miró’s free-associative playfulness or Gorky’s exacerbated emotionalism. Martin spoke of wanting her paintings to give people an experience like the one she felt when looking at nature, at grass, trees, sand, stone, and so on. In this sense, despite her works being nonrepresentational, they connect to the tradition of landscape painting: They have something to do with looking at, rather than being in, the natural word. And perhaps I also have to modify my statement about her paintings being nonrepresentational. They don’t represent anything in the empirical world, it’s true, but they do represent images that, according to Martin, already existed fully formed in her head before she started painting them. These were very small images—about the size of postage stamps, she tells us in a filmed interview that can be seen at the Guggenheim—and so one of her main technical problems was figuring out how to scale them up to the size she thought they should be in the world and on canvas: six-foot squares, it turned out, at least for all of her paintings from 1964 through 1993, after which the six-foot canvases became too unwieldy for an 81-year-old to handle and they became five-foot squares. So Martin turns out to be a kind of illustrator of hallucinations. I was shocked when I realized this, reading Nancy Princenthal’s excellent biography of the artist, and I’m even more surprised when standing in front of the paintings themselves. They are so alive, so present (despite also being so elusive), that it’s hard to imagine that they didn’t spring to life entirely from their materials—the canvas, the pencil marks, the variegated washes of color—but came from images in Martin’s mind. Carmen Herrera is a close contemporary of Martin’s. She was born in Havana in 1915, just three years after Martin was born in the little town of Macklin, Saskatchewan. Having found their separate ways to New York, neither was much attracted to the turbulent, emotionally demonstrative aesthetic of the Abstract Expressionists who ruled the roost in the postwar years, though both admired and got to know the least “expressionist” of them all, Barnett Newman. But Martin had an important dealer ready to stand by her, and she was part of a close-knit, lively community of artists living around Coenties Slip in Lower Manhattan. Her neighbors included Jasper Johns, Robert Rauschenberg, Robert Indiana, and Ellsworth Kelly, among others, who were all steering American art away from Abstract Expressionism. By the time Martin abandoned the city in 1967, eventually for New Mexico (after living on the road for a year and a half), she was a renowned figure whose work was exhibited prominently and discussed widely. Herrera’s fate was different. She worked in relative obscurity for a long time, exhibiting periodically but not in prominent venues. In most cases, her work was presented as that of a Latin American artist, although she’d left Cuba in 1939 and lived in New York, except for a period in Paris, for the rest of her life. Herrera is still at work at 101, and apparently time and place have finally caught up with her. The Whitney Museum of American Art is currently featuring an exhibition of more than 50 of her works from 1948, when she first committed herself to abstract art, to 1978—works that will be entirely unfamiliar to almost everyone who walks through the door. “Carmen Herrera: Lines of Sight,” curated by Dana Miller, will be on view through January 2, after which it will travel to the Wexner Center for the Arts at Ohio State University, Columbus, from February 4 through April 16. Like Martin, Herrera is a lover of line. “There is nothing I love more than to make a straight line,” she’s said. “How can I explain it? It’s the beginning of all structures, really.” But whereas Martin drew a multitude of lines in order to make them blur and disappear under your gaze, you’ll never find a drawn line in one of Herrera’s paintings. It’s your perceptual apparatus that produces the line for her, at the edge where two colors meet. And in Herrera’s work from 1958 onward—at least as far as we can tell from this show—no more than two colors ever meet in a painting. As often as not, one of those colors is white, yet she never uses it as a background. White is always a positive presence in a Herrera painting, just like the blunt greens or blacks or reds or whatever color it shares the canvas with. This is the elementary secret behind the power of her work, which is nothing less than the power to assert a continuous presence through time: the infinite alternation between positive and negative forms. A duality is set up, but it never becomes a stable hierarchy; the color forms keep shifting in emphasis so that the painting continually refreshes itself. The idea is simple enough; what’s rare is the aesthetic judgment. Not everyone has the taste for those unexpected balances found within an imbalance, which can allow the artist to put the idea to work a little bit differently, time after time, without wearing it out. Herrera has that judgment. The proof is in the exhibition’s central room, where Miller has hung nine from a series of white-and-green paintings that Herrera made between 1959 and 1971. In most of the paintings, white dominates quantitatively, but the experience is always of an equality of force between the two colors. For instance, in the earliest of them, two extremely narrow acute triangles of green emerge from the left and right edges of the canvas to touch near its center. One might at first perceive them as a pair of slashing forms on a white ground, but looking a moment longer, one can see the white forms above and below pushing toward each other on a green background. So—to repeat the looming question—if Herrera is so good, why has recognition come so late? It’s a question I have to consider personally. She had an exhibition at the artist-run Alternative Museum in 1984–85, where I was a regular and also friendly with the director, Geno Rodriguez. How did I miss her? Later in the ’80s, she exhibited several times (on the recommendation of a much younger fellow Cuban-American artist, Félix González-Torres) at the Rastovski Gallery, which was always on my path through the East Village. I have to imagine that in fact I did see Herrera’s work, and that somehow it simply failed to make an impression on me. Maybe I wasn’t yet ready for an art so understated. There are, either way, benefits to meeting an artist’s work in an untimely way. When I first encountered Herrera’s paintings, at the Lisson Gallery in London in 2012, I felt as if I’d opened a time capsule to discover something that might have been 60 years old but seemed as fresh and unhistoricized as if it had just been made (which, in fact, they had been). Here was an artist whose aesthetic was comparable to that of Polk Smith or Kelly, Ad Reinhardt or Alexander Liberman—the artists whom Betty Parsons was exhibiting alongside Agnes Martin in the 1960s. But her art was blessedly free of the familiarity that too often leads us just to nod politely and walk on. With Herrera, that first time I stood in front of her paintings, it was instead a wide-eyed “Hello! Who are you?” I also remained for far longer than just a minute.